Samford University senior classics major Sam Hahn of Siloam Springs, Arkansas, has been named a 2016 Rhodes Scholar finalist. The 2016 Rhodes Scholars will be elected Saturday, Nov. 21. The Rhodes Scholarships program, founded in 1904, is the oldest and most prestigious of international fellowships. Each year, the program brings to Oxford University 80 international students with the aim of promoting international understanding and peace. American honorees have included celebrated scholars, journalists, diplomats and public officials, including one U.S. president and one U.S. Supreme Court justice. “This is a dream come true,” said Hahn, who first heard of the Rhodes Scholarships in middle school. As he progressed through the Cambridge School of Dallas, Samford’s Great Ideas Summer Institute, University Fellows honors program and his classics major, Hahn found that the scholarship perfectly aligns with his education and interests. At Samford, Hahn has taken special interest in the survival of culture — especially ancient Greek literature — over centuries through oral tradition. 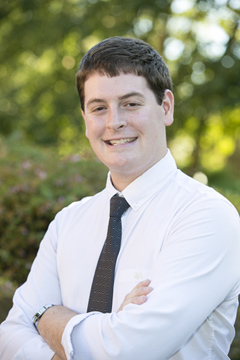 He earned an Alabama Power Scholarship via University Fellows for a summer 2015 research project in which he compared the bronze-age works the Iliad and the Old Testament. Hahn hopes to become a university professor, but he also sees important connections between the academy and public policy. “Some academics are able to make powerful change in Washington, or at the state and local levels, through their expertise,” he said. Hahn’s essay for the Rhodes Scholarship application bridged the academic and policy worlds in its focus on the destruction of antiquities by ISIS in the ongoing Syrian civil war. “The difficulty here reflects the difficulty of the conflict with ISIS in general,” Hahn said. “It’s really hard to know where they will be, so it’s very hard to protect sites, especially in light of the refugee crisis.” Hahn said that as painful as it is to see world heritage antiquities such as Palmyra destroyed, international intervention must focus on those fleeing the region. “Human life must be protected first,” he said.